Whether you grew up knowing about Krispy Kreme or have just tried one of our hot Original Glazed doughnuts for the first time, we thought you might be interested to learn a bit about of our long and rich history. You may not know that we’ve been around for more than 75 years! 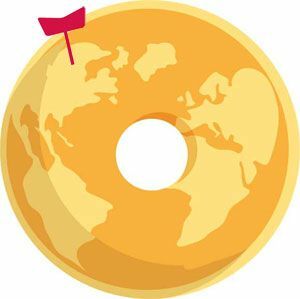 Vernon Rudolph bought a secret yeast raised doughnut recipe from a New Orleans French chef, rented a building in what is now historic Old Salem in Winston-Salem, North Carolina, and began selling its Krispy Kreme doughnuts on July 13, 1937 to local grocery stores. The delicious scents of cooking doughnuts drifted into the streets, and passersby stopped to ask if they could buy hot doughnuts. So he cut a hole in an outside wall and started selling Original Glazed doughnuts directly to customers on the sidewalk. By now there was a small chain of stores, mostly family owned. They all used the Kripsy Kreme recipe, but each store made its doughnuts from scratch. For Rudolph and Krispy Kreme, the results were always good, but not consistent enough. So Krispy Kreme built a mix plant and developed a distribution system that delivered the perfect dry doughnuts mix to each Krispy Kreme store. Then Rudolph and his equipment engineers invented and built Krispy Kreme’s own doughnut making equipment. 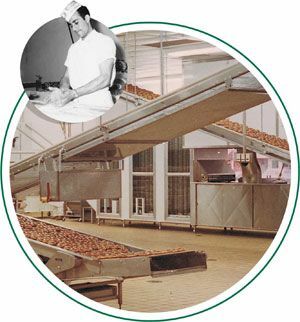 From the 1950s on, they focused on improving and automating the doughnut making process. During the 1960s, Krispy Kreme enjoyed steady growth throughout the southeast United States and began expanding outside of its traditional roots. The design of Krispy Kreme stores became consistent including the hallmark green tile roofs and heritage road signs. Vernon Rudolph, our founder, died in 1973, and growth slowed as the company was reorganized for sale to Beatrice Foods Company in 1976. In 1982, a small group of our early franchisees bought Krispy Kreme back from Beatrice Foods. A renewed focus on the hot doughnut experience became a priority for the company. They began to expand outside the southeast US and opened its first store in New York City in 1996. Soon afterward, in 1999, the first store in California opened and national expansion was well underway. 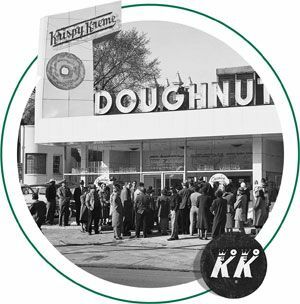 When Krispy Kreme turned 60 years old in 1997, it was officially recognized as the 20th century American icon with a donation of company artifacts to the Smithsonian Institution’s National Museum of American History. In April 2000, Krispy Kreme held an initial public offering of common stock. It opened the first international store in Canada just outside of Toronto in December 2001. The first stores outside North America opened in Sydney Australia and in London, England in 2003. Since then, Krispy Kreme has opened over 700 stores in Asia, Mexico, the Middle East, Puerto Rico, and Turkey. Our international expansion is continuing and in addition, we are working on new tasty products and we are very excited about our future. Stay tuned for more innovative things to come.